What’s it like to be the power behind the throne, especially when the occupant of the throne is a creative genius? You might wonder in today’s wild political world, when U.S. President Donald Trump routinely surprises and even shocks his closest advisors when they wake up every morning to read his latest tweets. It’s a big issue in the artistic world. Think about how George Martin guided the genius of the Beatles, or how Francis Ford Coppola captured the brilliance of Brando in his epic movie, Apocalypse Now. The right hand man is hugely important in the business world. Who else will choose the winners and losers from the flow of ideas emanating from the CEO who thinks – or knows – he’s on a roll. Phil Lind is one of the classics in this genre. He guided the entrepreneurial genius of Ted Rogers as he built his vast telecom firm. It was up to Lind to say no to the great man. Actually, as he has been telling packed rooms this fall, he didn’t actually say no. Rogers would think no was actually a green light to go ahead. Lind found other, more subtle ways to guide Rogers down the right path. 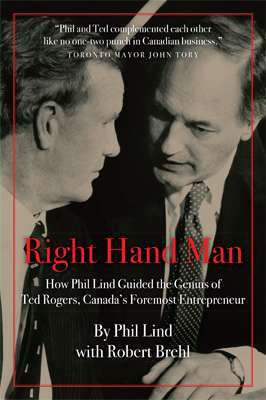 Lind is talking about his book, Right Hand Man, at the Canadian Club in Vancouver on Nov. 29. It’s a great read for Christmas.